BMW owners appreciate the quality and elegance that comes with the vehicles produced by the manufacturer. Now, environmentally conscious people are proud to own the BMW i8 coupe or roadster. The hybrid vehicles offer power and exquisite styling. Experience the power and performance the electronic vehicles provide by taking a test drive at your local BMW of Honolulu. The vehicles come with a rear-mounted gas engine that combines efforts with an electric motor, which is hidden under the hood. 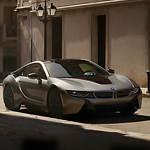 The i8 vehicles have enough power to deliver 369 horsepower. Feel the power as the vehicle easily goes from zero to 60 in a mere 4.2 seconds. The exteriors boast sculpted lines, sleek silhouettes and an aerodynamic design, which are used to create an unmistakable sporty appearance. The 20-inch wheels are jet black with copper and gray overtones. The vehicle's interior is no less impressive with leather and ventilated cloth seats and trim.